Hudson Baby premium layette collection of high quality cute baby clothing features 100% premium cotton for the softest touch on your baby's gentle skin. This long sleeve 5pk bodysuits are essential to any baby's wardrobe - and these bodysuits are so comfortable that they can be used as underwear or even on their own. The one-piece design with snaps makes for no fuss dressing - and snap closure at the bottom makes diaper changing easier. 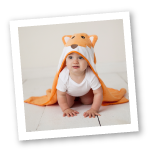 The seasonal design helps to keep baby comfortable and warm in cooler temperatures.